This might seem like a really simple question, but I am really troubled by it on a macro scale. The money has to come from somewhere. Someone might start up a business that creates things or takes things from the Earth. You could say this is "creating" money, but I argue it isn't, or I am missing something. I also have a similar question with trade deficits. How is it the United States can still grow, despite sending more money out than it takes in? Perhaps the answer to this question will solve the one above. Re: "You could say this is 'creating' money" - no you couldn't. This would be conflating money and wealth. Wealth can be created without new money being created - indeed wealth was created before money even existed. Conversely money can be created without creating wealth. So they are entirely separate things. A crude analogy: wealth is to money as apples are to numbers. You can count apples using numbers, but growing new apples does not create new numbers. With regard "In the end logically, this money becomes concentrated in a few people." - not true. People don't earn money in order to collect big piles of it and spend all day counting it. Instead they use it to buy stuff which means that the money circulates through the rest of the economy. With regard "How is it the United States can still grow, despite sending more money out than it takes in?"... it doesn't send out more money than in takes in (at least not to any great extent). Foreigners do not accumulate great piles of dollars that they earned from selling American's stuff - instead they use their dollars to buy American assets, like US government bonds. With regard how money is created, please be aware that this is a controversial area and there is a huge amount of misinformation on this subject. The best document to read that I know of on the subject of money creation is this one published in the Bank of England Quarterly bulletin in 2014. I understand your dilemma. Ill try to solve it simply with an example. I tutor students every day at a price of 25 dollars per hour. After the lesson, both me and my student are better off than we were before. This is because in my view, the 25 dollars are worth more than the hour i used and in my students view, the knowledge gained from my one hour was worth more than his 25dollars (otherwise, he would not schedule any more lessons). We both leave winners and better off than we were before. He is better off by the amount (value of the knowledge-25 dollars)and i am better off by the amount (25 dollars-value of my hour spent elsewhere). The economy as a whole is better off by the amount ( value of the knowledge gained- value of my hour spent elsewhere) (this value is obviously positive or the transaction would not have taken place). In short, value was created. Notice also how the dollar amount in the economy did not change (25dollars just changed hands), and the economy is not better by some amount of paper money but buy value in other forms. Realize that for a producer to make a certain profit, some consumer, somewhere, must have also made a certain profit. (These are the principles of consumer and producer surplus and one cannot exist without the other). Now, where i think you have gone wrong is in your thoughts about paper money. Say instead, i make 10000 cars out of iron that i mined and processed into steel. Also, 10000 people also each make 1 of various items in the same way (tv's, radio's, cell phones etc...). I will trade each car with each person to acquire each good. In the end, each one of us is better off because they traded their item for one of my cars (which they deemed was more valuable than their item) And I did the same but in the opposite direction. We will obviously agree that i got much richer and my standard of living will be much better than if i only had 10000 cars (or even nothing if i produced nothing), but the point here is that the poor man who only built a single radio is also better off by the amount (His valuation of the car-his valuation of the time he spent building the radio) We all got richer and no one got poorer. For Steve jobs to make 1 000 000 000$, 1 00 000 people had to acquire iPads. And everyone is better because of it. In short, in a free market with nothing but capitalism, there can be no such thing as 'wealth hoarding' because, as I've said repeatedly, for the rich to get richer, the poor have to get richer as well. Gross profits net of taxes = (Gross investment) + (Export surplus) + (Governmental budget deficit) - (Workers' savings) + (Capitalist consumption). The accounting identity is simplified relative to the full national accounts, and can be rearranged in various ways. Importantly, an accounting identity is a statement that is true by definition, it is not based on a model that reflects assumptions which may or may not reflect reality. Under normal circumstances, the economy is growing in nominal terms, and there are large contributions to this equation from gross investment and the budget deficit. Export-led growth countries, like China now, get large contributions from a trade surplus. In order for that company to work, they have to make a profit which means they have to take more money than they are giving. As seen above, aggregate profits are driven by various sources of money inflows to the business sector that are not expenses. Importantly, gross investment is a cash outflow that does not directly result in an expense. (Depreciation comes with a lag.) Therefore, firms can run profits without requiring others to have losses. In the end logically, this money becomes concentrated in a few people. If this is the case, on the broadest level, how is it that standards of living increase? Investment and new skills (technology) allow for greater output, which is what causes standards of living to increase. Isn't it inevitable that the rich get richer and the poor get poorer, with money being concentrated in fewer and fewer people over time? And if that is the case, won't capitalism eventually fall apart, with fewer and fewer people being able to purchase goods? If not, how is this corrected? This was an argument of Thomas Piketty's "Capital." I cannot hope to answer that debate here. However, the process is not inevitable. The 1920s was a period of increasing inequality in the United States (and elsewhere), but that was reversed by the 1950s. Inequality is a question of political economy. Money is created out of thin air. 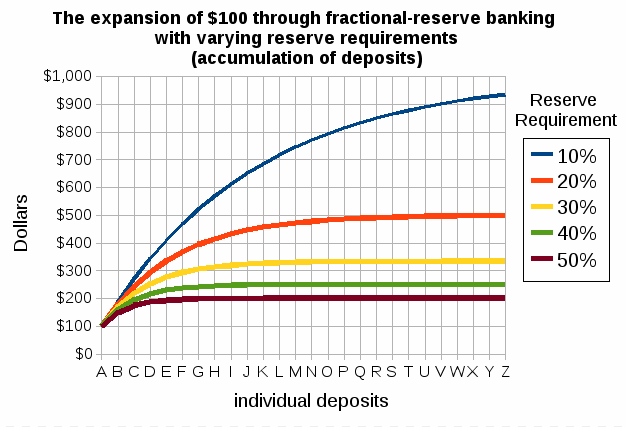 Almost all countries on the earth have implemented fractional-reserve banking system. This means that a bank only needs to hold a fraction of the money they lend out. Example: If you deposit 100 dollars in your bank, the bank may lend out your 100 dollars x 10 times (10% reserve requirement), thus creating 900 dollars out of thin air. This system is absolutely genius: When there is a demand for money, money will be created. When wealth is created money is created. Example: If you build a house with you bare hands, you would create wealth. A bank would now be willing to give you a loan using your house as safety deposit. Mark Zuckerberg did not take his money from other people. He created a new technology and thus created a demand for money and money was created. Very smart system if you ask me. The rich are getting richer because having money generates money through interests and investments. Being poor is expensive. You'll have to pay interests on your mortgage, student debt, your car and so on. Not the answer you're looking for? Browse other questions tagged macroeconomics economic-growth inequality wealth or ask your own question. What are the widescale economic ramifications of people holding onto their money instead of spending it? Are any of these tax dodging schemes actually realistic or exclusive to billionaires? What are the different patterns/quantity of employment according to demands of different income ranges?